The Maps app in iOS does not have the greatest reputation. Back in 2012, Apple made the huge decision to replace its Google-powered Maps app with one that was made by themselves but powered with external location data. It was one of the biggest changes introduced with iOS 6 and yet it went horribly and spectacularly wrong. Errors upon errors were reported by users, including missing towns, towns being listed in the wrong place, satellite images obscured by clouds, location searches directing people to the wrong places, and missing local locations too, such as schools. In a BBC report about the debacle, they noted that one screenshot “showed a furniture museum that was apparently located in a river”. There were also graphical errors like this screenshot which shows Maps’ glitchy version of the Brooklyn Bridge. That may have been three years ago but the Internet – and plugged in iOS users – never forget, and more can always be done to improve things. 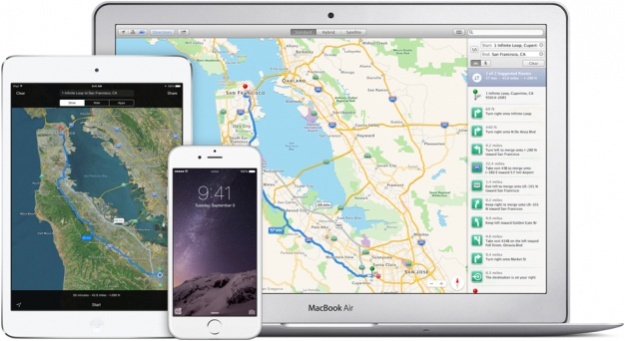 Plus, given that Apple is all about users using their iPhones on holiday to take glorious snaps and taking their Apple Watches on them when they’re on the run, a solid Maps app is a priority. And this is likely why Apple has now purchased a GPS company called Coherent Navigation. The purchase was noticed by MacRumors which explains that Coherent Navigation is made up of engineers from the prestigious Stanford and Cornell universities. According to the publication, much of Coherent Navigation’s work revolved around ‘iGPS’ which combines the data from mid-Earth and low-Earth orbiting GPS satellites for more accurate results that are more resistant to jams. After the report was published, Apple did confirm the purchase of the company, but they didn’t disclose the figure they paid. Apple also didn’t disclose what they plan to do with Coherent Navigation’s knowledge, nor what the company’s CEO and co-founders (who now list themselves as Apple employees) will be doing at the company, but we can infer a few things. Some people are suggesting that Apple will be putting Coherent Navigation’s work to good use by having them help with an overhaul of the Maps app. Not only would that make perfect sense given Maps’ history, but it also follows a string of other location-related companies in the past few years including WifiSLAM, Hopstop, Locationary, and Embark. Alternatively, some are saying that these purchases may enable the company to release an Apple Car. While the talk of an Apple Car is just secretive whispers at the moment, some are convinced that Apple will be releasing its very own vehicle at some point in the future. Just last week, billionaire investor Carl Icahn wrote a letter encouraging Apple to build an electric car. Given that Apple has already committed itself to creating new revenue streams (e.g the Apple Watch) and the Apple Car is one such revenue stream that would need brilliant location services, we could indeed be looking at Apple dominated roads soon.